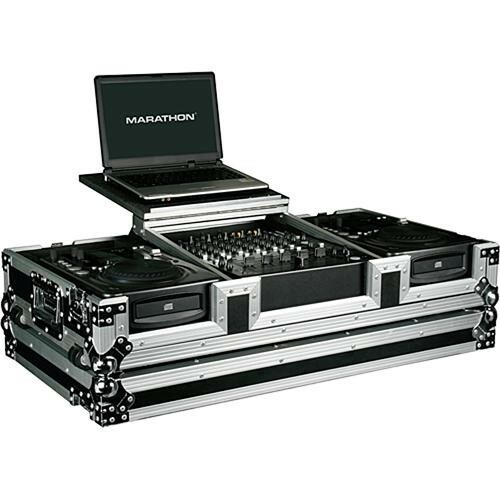 The Marathon MA-CDI12WLT Flight Road Cofin Case for Dual Medium Size CDI Players, 12" Mixer and 17" Laptop Computer (Black and Chrome) is an ATA -style case made to transport and protect two America Audio, Numark or Radius CDI players (digital turntables) and a 12" mixer. It has a shelf mounted above the mixer area that will hold a 17" laptop computer. The case is made from vinyl covered, laminated 3/8" plywood with an adjustable modular foam lining. It has recessed, chrome, dual tract, butterfly latches, heavy-duty powerful ball corners, and dual anchor rivets. It is transported by spring-action handles and low-profile, built-in wheels. The case includes mounting hardware. Box Dimensions (LxWxH) 39.0 x 23.0 x 10.0"